"When Tucker woke up on Saint Patrick's Day, he got off on the wrong paw." 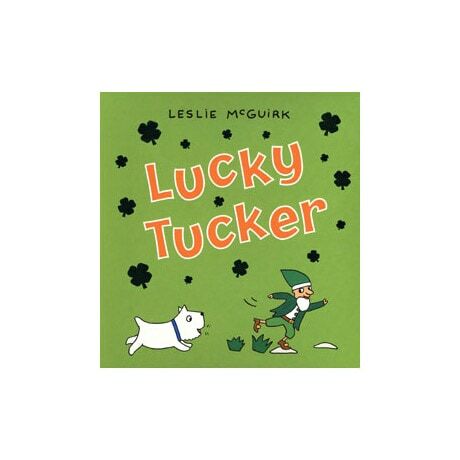 After being forced to take a walk in the rain before breakfast and losing his toy under the couch, the dog rolls in a lucky clover patch that belongs to a leprechaun, in this book for prereaders by the author-illustrator of Ho, Ho, Ho, Tucker! Pictured here in Leslie McGuirk's cheerful gouache cartoons, Tucker watches his luck instantly turn around, as he catches a falling scoop of ice cream in his mouth, plays with some friends at the dog park, gets a treat at a local bakery, and arrives home to find that a big box of toys has arrived in the mail for him.